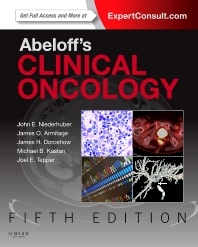 Practical and clinically focused, Abeloff’s Clinical Oncology is a trusted medical reference book designed to capture the latest scientific discoveries and their implications for cancer diagnosis and management of cancer in the most accessible manner possible. Abeloff’s equips everyone involved - from radiologists and oncologists to surgeons and nurses - to collaborate effectively and provide the best possible cancer care. Select the most appropriate tests and imaging studies for cancer diagnosis and staging of each type of cancer, and manage your patients in the most effective way possible by using all of the latest techniques and approaches in oncology. Enhance your understanding of complex concepts with a color art program that highlights key points and illustrates relevant scientific and clinical problems.